The weather today is exactly what you woulkd envision if you were to imagine a splendid spring day on the AT. The sky was blue, the sun was warm with just a slight breeze, and the views from the top of Beauty Spot were fantastic. I started the day a bit melancholy and homesick, and I decided that with the great weather I would not set a goal for the day but rather simply walk at a comfortable pace, stop whenever I felt like it, and get as far as I get. I spent almost two hours at Beauty Spot, eating lunch, enjoying the views, and even nearly falling asleep. I would have slept except that a little gust if wind came up and blew my hat off my face, and the sun was bothersome enough in my eyes that I had to get up and retrieve my hat. While I was lying there in a near stupor I decided that I was going to have a super lazy day and hike the half mile down to Beauty Spot Gap, hang my hammock in some nice sunny place, and spend my afternoon lazing in the hammock reading "Cannery Row." Alas, the best laid plans and all that. When I got dowsn to the Gap I saw that the spring and camping area was directly next to a road. Camping next to a road is bad policy in general, and especially on a Friday night, so I switched to Plan B and hiked the six or so miles on to here; Cherry Gap Shelter. I dealt with the homesickness pretty well and it didn't take over my day, but it does worry me. This is the thing that I think is most likely to cause me to abandon my hike, and the hike really is important to me (though I am not sure exactly why), so I don't want that to happen. I imagine this separation is even harder on Jodi than it is on me. She is going to work every day and coming home to an empty house every night. I at least am off on some sort of pseudo-adventure, and experiencing a new place every day. While I was hiking today I was thinking how great it would be if my car was parked at the end of the dasy and I could hop in and drive home and take a shower, then eat dinner with Jodi, sit on the couch with her leaning against me watching an episode of Deadwood, then go to bed and sleep with her in my arms. Instead, I ate some instant potatoe with slices of summer sausage in it, and will sleep in my hammock all alone. There is a hostel a few miles north of here and some southbound hikers told me they stopped there at lunch time today and the woman that runs the hostel made sandwiches and burgers and such for them. That sounds like a great idea and I think it is highly likely I will stop there tomorrow. A big greasy cheeseburger sure sounds more appetizing than a tortilla with Nutella, doesn't it? I climbed Roan Mountain today. From Hughes Gap at 4040 feet, the trail climbs to Roan High Knob at 6285 feet in 3.3 miles. The first 1000 feet are gained in about a mile and a half, then once you've warmed up with that little climb the trail gets serious and the next 1000 feet are climbed in a mile. Whew! After that you are more or less at the top and the grade eases up so you can enjoy yourself up high. And to make it even more interesting, I had already hiked about 14 miles just to get to Hughes Gap so I could start this little climb! It was actually another really fine day of nice hiking. About six miles into the day I came to Greasy Creek Gap and decided to walk down the siz tenths of a mile to the hostel named Greasy Creek Friendly (get it? Friendly versus hostel which almost sounds like hostile) to see if I could get some fresh cooked food. When I got down there a sign on the door asked to "Please knock," so I did. A guy withe the trail name of Shepherd answered and I told him I had heard a rumor that real food was available there. "Well, yes and no," he said. My heart sank, and I asked him if this was a yes day or a no day. He went on to tell me that the woman who ran the place and cooked was away at church, Saturday being the sabbath for Seventh Day Adventists. I believe I actually whimpered a little bit, and told Shepherd he was breaking my heart. Being a former thru-hiker he understood. Not all was lost as there at least were some microwaveable entrees in the freezer and I availed myself of a few of them, along with a couple of cups of tea, while I was there. Not the fat juicy cheeseburger and crisp fresh salad I was craving, but at least my detour wasn't for nothing, though I did question the wisdom of the extra 1.2 miles while I was plodding up Roam Mountain at the end of the day. It was colder than I expected last night, although the fact that there are still patches of snow on top of Roan Mountain should probably have clued me in. I am a bit slow sometimes. When it is cold I usually add my down jacket to the insulation under my hammock, and I should have done that last night. Still, I was only a little cold and slept well for the most part. third of a mile down the road to the B&B/Hostel. I could have stayed in the hostel for $18, but sleeping in a tightly packed bunkroom with a bunch of other smelly, wet hikers, and being 17th or 18th in line to use the shower, just didn't appeal to me today, so I sprang for ther bucks for one of the B&B rooms instead. The price of my room includes breakfast in the morning, and I hope it's a big, solid breakfast. The innkeeper even drove we to the next town west (in Tennessee) so I cxould get cash at an ATM, then drove me back east into North Carolina and up to a local steak house where I just had dinner. Two passes through the salad bar, a large Sirloin cooked medium, a baked potato, severl glasses of sweet tea (the waitress eventually left ther pitcher on my table), three servings of "Texas toast", and a bowl of peach cobbler. The whole thing, with tip, set me back $21. My B&B host was right, the place isn't much on ambiance, but the steak is good. I am just under 25 miles from Dennis Cove and the Kincora Hostel, my next planned stop. I could do an 18.8 mile day tomorrow, and have only 6 miles left on Tuesday to get there. That would give me plenty of time to do laundry and stuff if I wanted to. On the other hand, this rain is supposed to end tomorrow morning and I could take my time eating breakfast and get a later start and maybe avoid getting wet. There are some spots with water and camping before the 18 mile mark, and with the nice weather it might be more enjoyable to be hiking than hanging out at a hostel. I'll be in Damascus ("the friendliest town on the AT") by Thursday or, more likely, Friday. I'll probably take a zero there and do laundry, shop for my resupply, and hopefully get computer access and get all my photos processed and uploaded while I'm there. While hiking today I was thinking that it might be fun to try to photo-document what a "typical" day on the trail is like, and upload the photos as a separate kind of photo-essay to my web server. Does that sound stupid, or might you be interested in such a thing? A day on the trail is really pretty simple, and I'm not sure there's much to tell, but I might be wrong. Oh, I should hit 400 miles tomorrow! Another milestone. hikers and we ended up walking about a mile before we got a ride, but I didn't count that mile because I wasn't planning to walk it. And, of course, when I am in town I often end up walking all over town to get all my town chores done, but I don't try to include any of those miles. Like I said, the definition is rather arbitrary. Wow, I am really rambling tonight. It must be all thaqt protein flooding my system. There is microwave popcorn in my room, as well as a refrigerator with cold soda in it, so I think I will settle back and indulge while watching a movie on TV. I wrote about the climb up Roan Mountain that I did yesterday. 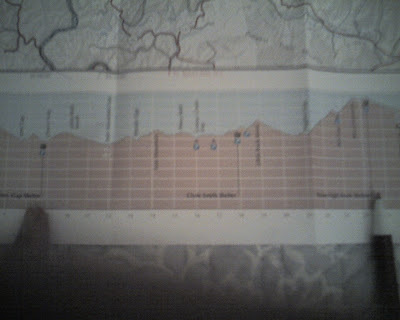 This is a rather poor cell phone photo of the elevation profile for that hike. I started my day where my finger is pointing at the left, and ended atop Roan Mountain where my pen is pointing. The start of the climb, at about mile 14 in my day, is at the second fold you can see in the map. I just thought you might find this a bit interesting, though I realize most of the world's population does not share my fascination with maps. Look! I've passed the 400 mile mark! Lately whenever I have slept indoors I inevitably wake up at 3:00 or 4:00 am and find it impossible to get back to sleep. Well, not last night. I slept the sleep of the innocent and woke up a few minutes after 7:00. After a quick shower I went downstairs and was greeted by an absolutely huge breakfast. There were only two of us eating breakfast, yet the table was laden with platters and pans of food. Eggs, bacon, sausage, biscuits and gravy (which I love, by the way), home-made cinnamon rolls, cantaloupe, strawberries, kiwi, some kind of little chocolate cakes with cherries on them, orange juice, coffee, tea, and probably something else I've forgotten. We ate and chatted and ate some more, for about an hour and a half. Finally, I had to break away and go back upstairs and get my gear packed. It was about 9:30 when I finally set off up the hill back to where the AT crossed the road. The trail had a very different feel today. For now no more big mountains and remote terrain. Today the trail wended its way through semi-rural country. It was a pleasant change, and gave my legs a bit of a rest since there were fewer and easier grades to climb and descend. The day started out warm and humid, and being at a lower elevation spring was further along here. The trail climbed through some old meadows starting to grow back to forest, and the grass was a vibrant green with the first dandelions making an appearance. Sometime this morning I crossed from Tennessee into North Carolina for the last time. I was back in North Carolina for only a tenth of a mile or so, then it was back into Tennessee where I will stay until I reach Virginia at the end of the week. Goodbye North Carolina. That makes two states down now, with 12 to go. I reached Mountaineer Shelter about 8 or 9 miles into the day, a few minutes before 1:00. I stopped here to eat lunch since the skies were clouding up and I was hit with a few quick showers. A few minutes after I stopped CupAJoe and Duct Tape showed up, and then OG. CupAJoe and Duct Tape are a young couple from Maine, and we have been hiking on more or less the same schedule since back in the Smokies. OG I met for the first time today. He had been ahead of me but had taken a couple of days off with a friend and had just returned to the trail this morning. This afternoon the wind picked up and dark clouds started moving in. As I hiked a series of rain showers went over, each a bit heavier and lonmger lasting than the previous. In between the sun did shine, but less and less. It was a fairly long day at nearly 19 miles, and I didn't reach tonight's destination at the Moreland Gap Shelter until a quarter after five. The sign at the shelter, just like the signs at all the shelters in this area, said the watedr source was 50 yards away. I don't know what they use to measure distance around here, but back home I think this 50 yards would have measured out to at least a quarter of a mile! It took me 15 minutes to walk down to the water, fill my 2 1/2 liter botle, and walk back up to the shslter. Just about this time CupAJoe, Duct Tape, and OG all showed up. A few minutes later it started to rain, so I waited out the rain under the roof of the shelter, then during a lull I set my hammock up for the night. The temperature was dropping fast and I put on nearly all of my clothes, including both my down liner jacket and my heavy down jacket. I've been continually sholcked by the amount of litter and graffiti at the shelters hereabouts. I am SO glad I am not sleeping in the shelters. I took a picture of this one so you can see what I'm talking about whenever I get the photos uploaded. When I originally planned my hike I think I had a mail-drop scheduled for the Kincora Hostel, in Dennis Cove, TN. At some point I decided I had too many mail-drops and in an effort to remove some I decided to rely on being able to get a shuttle from Kincora into town to buy food. It is only about six miles from the Moreland Gap Shelter to the Kincora Hostel, and I arrived there about 10:15 this morning. Bob Peoples run Kincora and asks only for a suggested donation of $4.00 to stay there. He is pretty much a legend on the AT. When I got there he was not home, but I talked to some of the other hikers to try to get the scoop on what was going on and how things worked there. From what I was told Bob offered shuttles into town eratically and you neer knew when he might be ready to go, or exactly where he would take you. I didn't have enough food to make the next 3 days and 50 miles into Damascus, VA, so I had no choice but to get to town somehow. One hiker told me he had to stay an extra day to get a shuttle to the store. I can't afford an extra day, as it is going to be very tight as it is for me to reach Damascus before the post office closes at 4:30 on Friday afternoon so I can get my bounce bnox and another package that Jodi has mailed to me there. So, I took a look at my copy of "Appalachian Pages" and saw that if I continued up the AT past Laurel; fork Falls and through Laurel Fork Gorge, there was a side trail in about three miles that would take me one mile to the road just outside of Hampton, TN. The book also told me that there is a grocery store and a hiker hostel in Hampton, so that decided it for me. The gorge and the falls were beautiful, and in what looked like some kind of divine confirmation of myh decision, the rain stopped, the clouds parted, and the sun shone as I picked my way through the gorge and along the river. By noon I was at the side trail, and 20 minutes later I was walkikng down the shoulder of the road into town. My first stop was Brolwn's Grocedry, which is half grocery store and half hardware store, advertising both Mac & Chese and Hog Wire. You need it, Brown's got it! The couple that own the grocery store also run a hnostel in their home, known as Braemer Castle. I got directions from the cashier at the store and walked 3 minutes up the road. Luckily I caught Sutton (the owner) just as he was about to leave. He brought me inside and showed me around. This place is a great find! The bunkroom, downstairs, is being renovated and thus was closed, but they offer private rooms upstairs for $20 each. So far (3:45PM) I am the only one here. The place is huge, and spotlessly clean. It is an old building and all the floors tilt in one direction or another. The floors are all hardwood. There is a large common afrea, a kitchen, some comfortable chairs and a couch, an old TV with a few VHS movies to watch, and great big windows for lots of light. Apparently everyone in town knows where Bud lives, except for me! Dismissing the laircut for the time being, I walked further on down the road until I got to the Copper Kettle RFestaurant, where I had a BLT and fries, followed by some peach cobbler, all accompanied by some sweet tea. I asked one of the guys wortking at the restaurant if he knew what was up with Bud's Barbershop, and he told me that Bud comes and goes as he pleases. Her also noted that Bud has been around pretty much forever, and that Bud used to cut his grandfather's hair. I walked back and when I passed Bud's I saw that he was now in his shop, so I stopped and got my hair cut and my trimmed a bit, so I don't look quite so much like a homeless person. While cuting my hair Bud asked me if I liked winter, and told me that it is supposed to get cold and even snow a bit tonight. I knew that already, but played along and told Bud since I was from Bahsten I knew all about snow and it didn't bother me. I am back at the hostel right now typing this. The wind is getting pretty furious outside, and the whole building is creaking. I've got to go through my food bag and make sure I've bought everything I need for the next three days to Damascus, and at some point I'll venture back out to get some dinner. It will be good to be indoors out of the storm tonight. So, some folks have nolticed that I spend the night in a hostel once or twice a week, and are wondering why. Well, it's springtime in the mountains, and it is COLD and WET. It rains 4 or 5 days a week. It's windy. It's cold. After being cold and qwet for three or four days, it feels really good to spend a night indolors, take a shower, and get my sleeping bag and other gear dry. I think Anju was the first to comment on the fact that I am eating a lot of meat nowadays. A lot of you know that I used to be a fairly die-hard vegetarian. I am no longer a vegetarian at home since Joldi and I have found a local farm that raises beef, pork, lamb and chicken all on pasture. That addresses all of the ethical issues that causede me to be a vegetarian. Now,of course, that doesn't help a whit when I am off traveling, and if I were to follow my ethical principles I wouldn't eat meat on this trip, but my body craves it! I am hiking 8 - 9 hours every day, and that takes a huge toll on my body. I need all that protein to repair the damage I do every day. So yes, I fgeel a bit guilty about it, but I am goingf to continue eating meat whenever I get to town and have a chance to do so. And Ken, when are you going to come out and hike with me? The next three days are going to be tough. I could do about 22 miles tomorrow to Iron Mountrain, then 16 on Thursday to Abingdon Gap. That would leave me with about 10 miles on Friday into Damascus, so I would be there in plenty of time to get to the post office. 22 miles; ouch! CupAJoe and Duct Tape are planning to take "the Kincora Challenge" and try to hike the entire 50 miles in 24 hours. Damn kids! I told them if they did it, or even came close, I'd buy them dinner if I ever catch up with them again. Today was mostly just about making miles. It's called "the post office marathon" on the trail, which is when you have to hike crazy miles in order to get to a town before the post office closes for the weekend. In my case, I am trying to get to Damascus before 4:30 on Friday afternoon. My bounce box is waiting in the PO there, and so is a package Jodi sent that contains a second battery for my phone, and more importanbtly, some home-made cookies. Yum! I woke up a few minutes after 5:00 this morning and used the hostel kitchen to boil water so I could have some oatmeal. Then I packed up my gear and hit the trail, with my headlamp on, sometime before six; I'm guessing about 5:45. The side trail thast brought me back to the AT is mostly along an old road, so it was fairly easy to follow it even with my weak little LED head-lamp. When I turned off onto the AT and started climbing switchbacks up to Pond Flats it was a little challenging, but it soon started to get light. By the time I got down to the road, 7 miles into my hike but less than 2 1/2 road miles from where I slept last night, it was about 8:30, the sun was getting warm, and it was nice and calm down by Watauga Lake. I stripped off most of my warm clothes and enjoyed the trail around the end of the lake and eventually across the dam. Then the trail started climbving and I was very warm until I got up on the ridge and the north wind got me in its sights. After this it got colder and colder. I got here about 3:00PM, amazingly. I'm quite tired, but tomorrow will be a more sane day of less than 16 miles. Someone that was here last night wrote in the shelter register that there was snow this morning. It's still darn cold, and I have been adding more and more layers of clothes since I stopped. I think it will be early to bed tonight just to stay warm. Surprisingl;y, the weather forecast I saw last night says we should be hitting the 70s and 80s by the end of the week. Go figure! A great night's sleep, followed by a glorious day. Finally! Finally, we got some really, really nice weather. I woke up once during the night and had to get out to pee; the sky was full of stars and I could see the lights down in the valley. It was cool this morning, but the sun was shining and the temp was coming up fast. I had only about 15 miles to go and the terrain was relatively easy, so I consciously decided to take it easy and enjoy my day as much as I could. It somehow worked out that I managed to be in the right frame of mind when such a beautiful day presented itself. I wasn't trying to do big miles like yesterday, and I knew today wouldn't be a physical challenge. A few miles into the day I met Pop and Gwemmy, two retired local hikers out for a day hike carrying a big bag of snacks to hand out to the thru-hikers. They gave me a couple of Rice Krispy treats and a tangerine. Later in the morning I passed several groups of seniors out for a day hike, and when I stopped at Double Springs Shelter to eat lunch, they soon all showed up. 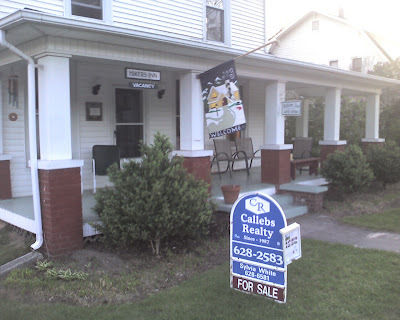 I enjoyed talking with them, and one of them gave me several mini Snickers bars, which I wasted no time in consuming. It's a beautiful evening right now, and I am here with 5 other hikers. Three of them I met last night, and two just this evening. I did some of my laundry when I got here. I doubt my socks will dry overnight, but they will dry on the back of my pack tomolrrow. I promised some of you I would do a "Da in the life of a hiker" thing, and toda is the day I picked to do it. Hopefully I will be able to get all my photos uploaded while I am in Damascus. Damascus is just ten miles away, so I should be there around noon tomorrow. I haven't decided yet if I will take a zero there or not. I think it depends mostly on whether I can get enough computer time to take care of all my photos. Then I need to shop for the next 5 or 6 day leg. From Damascus I will be off for thr Grayson Highlands. Oh, sometime tomorrow morning I will walk out of Tennessee and into Virginia! Okay, I feel disjointed and incoherent tonight, so I better quit. It was warm when I went to bed on Thursday evening, early because the gnats were bothersome, and I think it was even warmer when I woke up at 6:30 on Friday morning. A town day is always exciting. I guess that's a sign of how simple life on the trail is. The idea of a hot shower and real food just makes me giddy. So I wasted no time in eating breakfast and getting on the trail, and I was headed out by 7:30. It was a bit over ten miles into Damascus, and I was walking under the "Welcome to Damascus" sign by 10:30. By 11:00 I had secured a room at the Hikers Inn and was on my way to settling into this wonderful little town. It is Sunday morning now and soon I will stuff everything back into my backpack and head out of town. The weather has been gorgeous the last few days, and it looks like there should be about three more days of sun and heat before we get some clouds and showers on Wednesday, Thursday, and Friday. I noticed a warning of increased fire danger in the area when checking the weather this morning, due to the heat and low humidity. I'll have to be careful to drink more water with the heat now, but first I am going to concentrate on one last town breakfast before hitting the trail. hurried so the captions are sparse. My apologies.